Atlas Obscura profiles another really strange non-European weapon. The urumi hasn’t regularly been used as an actual weapon for generations, but even as a demonstration weapon, it is still incredibly dangerous. Especially to the user. 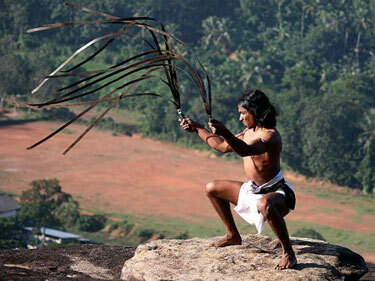 The urumi (which can be translated as “curving sword,” and is also known as a “chuttuval”), hails from southern India. The historic weapon was saved from the erasure of time when it was incorporated into Kalaripayattu martial arts, an Indian fighting style that is considered one of the oldest in the world. Incorporating elements of yoga and performative dance, Kalaripayattu movements look like violent but graceful choreography. Urumi fighting is no different, it is just far more dangerous to those who would attempt to learn the skill. Like any sword, the urumi comes in a number of varieties, with a variable length, and even a variable number of blades, but they all follow the same basic construction. Usually simpler than more elaborately decorated sword weapons, at its simplest, the urumi consists of a hilt connected to a thin, flexible steel blade. The handle is usually protected by a crossguard and knuckle-guard. The long blades extend somewhere between four and six feet in length (or even longer in some cases), and around an inch in width, but the aspect that makes the weapon unique is that the steel is always thin enough to flop around. Almost like a cartoon-version of a rubber sword. Given the urumi’s unique construction, wielding it is also an art unto itself. Since the flexible blade is no good for stabbing, it is slung around similarly to a traditional leather whip. In order to make continuous strikes with the weapon, it must stay continually in motion so that the momentum which gives the blade its slashing power is not lost. This usually requires the user to swing it over and around their head and shoulders in furious arcs. While this makes the urumi incredibly hard and dangerous to use, it also provides it with one of its major benefits as a weapon. When the blade curves around the sword wielder in quick arcing slashes, it creates a defensive bubble of flying metal that an opponent would be reckless to get close to. In addition, it makes a terrific weapon for defending against multiple opponents, both by providing a good barrier at a number of angles at once, and for the long, wild attacking arcs the steel whip provides. Urumi sparring incorporates small buckler shields that are used to deflect direct swings of the weapon, but when the urumi was used in actual combat, it was said to have had the added benefit of curving around the edges of enemy shields, landing cuts even when blocked. As an added bonus of having a wildly flexible blade, the urumi could be tightly rolled up for easy travel and concealment. In fact, it has often been worn as a belt. Of course all of this versatility comes at a price. As you can imagine, winging metal whips around your delicate face flesh at high speeds can easily result in a missing nose, or other mishap. Wielding the urumi correctly and safely takes years of training, learning techniques for everything from bringing the blade to safe stop, to altering the rotation of your swings without slicing your arm off. the Archives of Never Yet Melted in the 'Chuttuval' Category.